How to Easily Add Color to Your Home? Whether it is how we choose to dress, or our homes, adding color can be a daunting process. Fears of rooms looking like a toddler’s crayon set exploded everywhere often hold us back from trying something different. But, it doesn’t have to be that way; in fact, it is quite easy to deliberately give your home an injection of color other than beige. If you want to add color to your home and keep it looking like a magazine spread, keep in mind the 60-30-10 rule. This translates to 60% of the room in a dominant color, 30% in a secondary color, and 10% in an accent color. In most spaces, this rule breaks down into the color of the walls (60%) which acts as the overall theme, the color of the upholstery (30%) whose role is visual interest, and an accent piece (10%) that is the finishing touch not unlike a pair of earrings. Here are some more pain-free ways of bringing your home one step closer to (a very chic) rainbow. One of the easiest ways to inject color into your home is by color-coordinating your favorite reads. Whether you have a large display, a small bookshelf in the corner of a room, or a pile of glamorous coffee-table books, color coordinating the items make a statement. If you are interested in stacking coffee-table books, display the ones with the most attention-grabbing covers on the top! While we are on the subject of books, have you thought about painting the back of your bookshelf? This can add a lot of interest to the piece and help the items on the shelves pop out. Another accessible and affordable option is to replace the pillow covers on your couch or bed with vibrant patterned ones. Maybe you found a special one on your travels, or just can’t make a decision, but buying pillow covers is a quick-fix when you are in need of a boost of color. To do this, all you need is stuffing from your local craft store, and then you can fill them up! For those of you who are slightly scared of color, small accessories are the easiest way to get the ball rolling. In addition to pillow covers, items such as coasters, curtain ties, flowers, lamps, and throws are practical homeware items that can be rearranged and swapped as you see fit. Even something as simple as hanging a charm from a doorknob can bring some interest to an otherwise dull room. Place colorful trays and bowls around your house to collect keys, loose change, paperwork, and jewelry! While not as affordable as the smaller accessories, accent rugs can instantly transform a room. Once you have found one that speaks to you, place it strategically in front of a chair or under a coffee table in a living room or on top of hardwood floors in a kitchen. Don’t be afraid to choose a contrasting color or a clashing print! Additionally, large-scale linen like a vibrant blanket on the end of your bed can transform a room. You might even want to have seasonal lines to go with the changing months. Once you are ready for a new one, fold the previous one up and stock it in the linen cabinet for when it feels fresh again. When you are serious about your hues, consider painting one wall in a room a different shade. 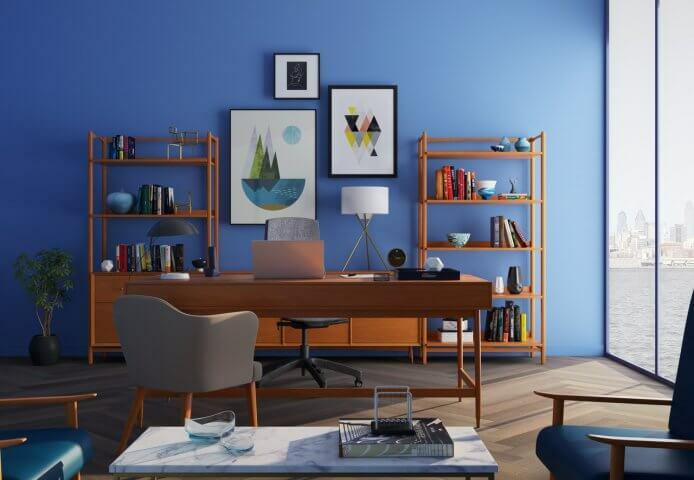 Having just one painted wall completely refocuses the attention of the room and is a perfect project if you have a room with a niche that you want to accentuate. If this seems like an overwhelming project to accomplish on your own, consider working with an interior fit-out company in Abu Dhabi. Similarly, investing in some bold wallpaper for a small space in your home can add a zest for life. Wallpaper is more expensive than paint, but it can also give a lot more drama. Powder rooms with floral prints, living rooms with palm tree prints, bedrooms with star prints… the options are endless. Plus, if you have any wallpaper left over, you could line drawers with it, or jazz up the back of a closet or bookshelf. However, if you are still having nightmares about bringing pigmentation inside your home, contemplate brightening up your outside space. If you don’t possess the proverbial green thumb, the best gardening company can help you brainstorm ideas for your new oasis. Your home should be the truest expression of yourself! Rachel Hennessey works on Business Development for Hennessey LLC. She helped increase the Pools and Landscaping Division’s client base by 75% and was in charge of the Hennessey DLP handover in Jumeirah Golf Estates, Flame Tree Ridge. PrevOptimizing with Oracle Data Tools- All under one roof!